We take our individual clients dreams, lifestyles and tastes and make them the core of our creative process. Our greatest strength is in interpreting and articulating the vision our client has for their home. We then use our creativity and imagination to make it not only a dramatic artistic design but a place where our clients can kick their feet up and call it home. We do it all. For over 30 years we’ve been pleasing clients. We do it with individual and personal service, and we do it within our client’s designated budget. Our clients become our greatest fans and best friends. We have clients whom we’ve done project after project for and home after home for. Our many repeat clients are a testimony to our longtime success . Your dreams, Your life, Your Style…Blended together in timeless design. Joan Peters is a top Interior Designer in San Diego. 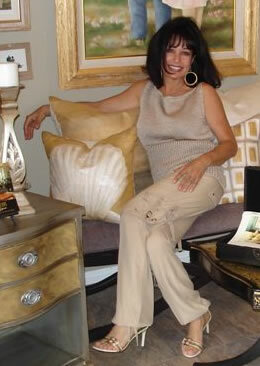 She has been helping clients beautify their homes since 1979. While most of her projects are in San Diego, she has helped clients from Chicago to West Los Angeles to McCall, Idaho. She has been doing Interior Design segments on KUSI Good Morning San Diego for a couple years. She is the host of a talk show radio show called Joan Peters Design & Style on KCBQ AM 1170. She has taught interior design classes and given Interior Design seminars to clubs and organizations throughout San Diego. We do projects as large as from the ground up and placing walls and windows to as small as a single room or a one week makeover. We provide services such as: TOTAL HOME DESIGN CONCEPT , REMODEL AND NEW CONSTRUCTION, SPACE AND FLOOR PLANNING, COLOR COORDINATION, COMMERCIAL DESIGN, CUSTOM CABINET DESIGNS, KITCHEN AND BATH REMODELS, LIGHTING AND ELECTRICAL, EXTERIOR HOME DESIGN, HOLIDAY AND PARTY DESIGN AND IN-HOME DESIGN CONSULTATION. We will provide all the interiors for your home or office from flooring and wall treatments to every last accessory. Our team of subcontractors give our clients the very best quality and service.